Biology and engineering can be a difficult lesson to get across in a short period. 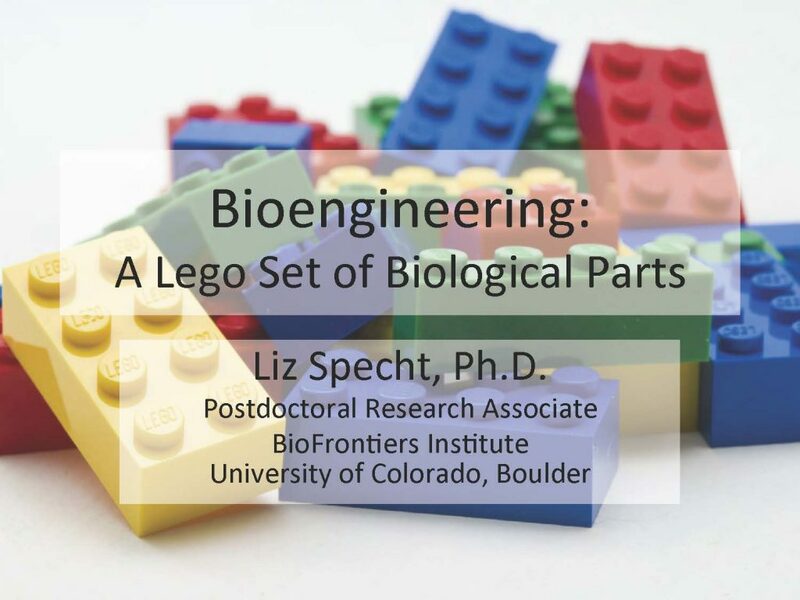 Dr. Liz Specht from the BioFrontiers Institute at University of Colorado, Boulder, created this Lego-based activity to assist the teens in their understanding of this broad topic. We like to think of it as the application of engineering principles to biological systems. Bioengineering as a defined field is relatively new, although attempts to solve biological problems have persisted throughout history. Recently, the practice has expanded beyond large-scale efforts like prosthetics and hospital equipment to include engineering at the molecular and cellular level – with applications in energy and the environment as well as healthcare. A very broad area of study, it can include elements of electrical and mechanical engineering, computer science, materials, chemistry and biology. This breadth allows students and faculty to specialize in their areas of interest and collaborate widely with researchers in allied fields. Graduates are well placed to work in management, production or research and development in a variety of industries – such as medical devices, diagnostics, genetics, healthcare industry support, pharmaceutical manufacture, drug discovery, environmental remediation, or agricultural advancement – as well as in nonprofit and academic research. Many go on to receive advanced degrees in bioengineering or a related field, or to medical school. Other students find the rigor of bioengineering a useful launching point for careers in business or law.